Rocking and shuffling its way into the Liverpool Empire Theatre, Footloose follows the lead of its motion picture predecessors by presenting a story that is part-drama, part-romance and part-musical. The cast consists of many young talents, and as with the movies, the stage show is clearly aimed at the teenage market given the tone of the show and the relationship-based storylines. Footloose tells the story of Ren McCormack (played here by Luke Baker), who having previously enjoyed life as a Chicago resident, is sent to live with his aunt and uncle in the much smaller town of Bomont, West Virginia. As he struggles to fit into his new surroundings, matters aren't helped by the fact that his Chicago background, his previously carefree attitude and his propensity to dance make him enemies very quickly, from the almost zealot-esque Reverend Shaw Moore (Nigel Lister) to the unpredictable yet generally harmless Willard (played here by 911 member Lee Brennan). But whilst a group of high school girls also take the time to regularly taunt Ren, one of those girls, Ariel Moore (Hannah Price) is clearly teasing Ren because she is developing a crush on him, much to the chagrin of her current boyfriend, the more rebellious and sinister Chuck (Matthew Tomlinson). The plot thickens as the town begins to accept Ren for who he is, whilst he gets ever closer to Hannah. But those with authority continue to look at Ren with disdain, and his repeated attempts to instil the spirit of dance within the community are frowned upon due to a complete ban on dancing after an accident which took the lives of four young men, all of whom had a similar passion for dancing, five years earlier. Ren realises that the only way to get the town on his side, whilst also trying to liven up a generally dull community, is to propose a major dance event, but with a notoriously stubborn Reverend being the chief decision-maker, can Ren's big idea really become a reality? And how will things develop between Ren and Ariel with the dangerous Chuck on the scene? Events take an unexpected turn when a twist in the tale is revealed that has a widespread effect on all major plotlines, leaving the audience wondering how the story will reach a happy ending. Throughout the story, we get a good amount of musical numbers, accompanied by major dance sequences. 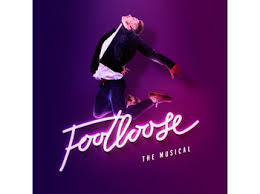 Of course, Footloose is the most memorable tune of the production (look at the name of the show), and thus it is this routine which is the strongest performance of the evening, at least from a dance perspective. Other popular songs include Holding Out For A Hero and Let's Hear It For The Boy, used during the overly-nervous Willard's attempts to learn the art of dance (which Peter Kay paid homage to in a similar, and rather funny, scene in an episode of Max & Paddy's Road To Nowhere). Maureen Nolan, who plays the part of Vi, plays a surprisingly infrequent role in the show, and therefore has fewer musical moments than one might have anticipated although she lets her talents shine through during Can You Find It In Your Heart? Arguably the best singer in the show (or at least the performer who provides the strongest vocal performances of the production) is Hannah Price, who as Arial stands out in both the popular, funky dance numbers and also the quieter, lesser-known songs, such as Learning To Be Silent and Almost Paradise. As for the acting: Nigel Lister does a very convincing job as the Reverend Shaw, whose authority and religious beliefs lead him to the conclusion that he is always right and that his power and opinions should not be challenged, regardless of the logic of those speaking to him. Luke and Hannah portray the young blossoming couple well, but the often-confused, low-on-confidence-yet-always-up-for-a-fight Willard character is probably the one who audiences will most remember; his personality takes a complete turn at various points, often during the same scenes, which leads to some funny moments. The settings are realistic, from the Reverend's parish to the Bomont high school cafeteria and sports gyms, and the costumes are true to the attires used by characters on the big screen. And in an interesting twist, much of the music used to accompany big numbers are played by the characters themselves as opposed to a leading cast of backing musicians; yes, there are some unseen musical performers providing some support (such as David Keech, a very skilled drummer), but the performers themselves have a big hand in providing the music; for instance, the Chuck character plays both the guitar and the piano at different times. The downsides to the show for me were that there weren't many laugh-out-loud moments, meaning that the comedic scenes largely did not reach the heights that had been anticipated; and the audio levels were unusually low in the early going, making it hard to hear the opening Footloose rendition and some of the conversations during Ren's move from Chicago to Bomont. Although this isn't a fault of the producers, I have to mention that the number of audience members coughing loudly during the quieter, more dramatic scenes near the conclusion was ridiculously high, to the extent that it almost became hard to hear what was being said during this part of the show either. Footloose is definitely a show aimed at the teenage audience; everything about it feels like a high school story come to life on the stage, accompanied by some pretty cool music. Some of the language used makes this a show to perhaps avoid for the younger kids, and whilst the older generation will appreciate the production (especially those who remember the original movie released in 1984), the storyline and its intricacices may make them wonder what is going on at times. I enjoyed the show, and teenagers and the 18-30 crowd would definitely get a kick out of it, but I wouldn't say that this is an essential show to go out and see.